We’ve been having area-wide lease sales over the same portions of the Gulf of Mexico for the last 30 years. Despite this week’s tepid response at the Western GoM Sale (shelf and deepwater offshore Texas, mostly), the press release from the Bureau of Ocean Energy Management would have you thinking it was a smashing success. The US Bureau of Ocean Energy Management’s western Gulf of Mexico Lease Sale 233 offshore Texas netted $102,351,712 in apparent high bids—less than the first two sales in the Obama administration’s Outer Continental Shelf oil and gas leasing program for 2012–17. Twelve offshore companies submitted 61 bids for 53 tracts covering 301,006 acres. Nearly 21 million acres were available for oil and natural gas exploration and development. It was even worse than that. Two adjoining blocks accounted for fully 50% of the total high bids. Almost all of the action was in deepwater, and few blocks drew bids that substantially exceeded the minimum bid level. Only four, count ’em four, shelf blocks drew any bidding attention at all. In fairness, the shelf in the Western Gulf is gas-prone, and gas prices are historically low compared to oil. But industry’s tepid response to the sale also reflects concern about Interior’s increasingly stifling and costly approach to regulation. 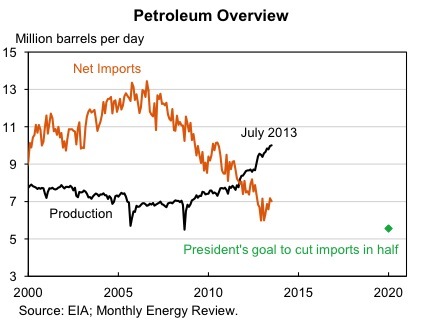 The President established a national goal in 2011 to reduce oil imports by one third by 2020 and elevated the goal in 2012 to reduce them by one half by 2020. We are currently on track to meet this ambitious goal if we continue to follow through on the policies that are critical to achieving it. Whenever someone shows you a graph with a y-axis that starts at a value other than zero-point-zero, they’re trying to sell you a bill of goods. Government funded research supplemented private industry’s work to develop the technology that sparked the boom in oil and gas production. Crude oil production has grown each year the President has been in office to its highest level in 17 years in 2012 (see chart above). In fact, over the past four years, domestic oil supply growth has accounted for over one-third of global oil production growth. None of the statements in that paragraph are demonstrably false, but they are stated in a way to suggest that somehow the boom would not have happened without government support, and that Obama is its biggest cheerleader. This is a classic example of the Post Hoc fallacy. Saying the government deserves credit for the shale boom is like saying that Noah deserves credit for discovering the New World* in 1492 due to his pioneering research in marine architecture. We are often reminded that petroleum development often take years. In other words, “You didn’t build that”, Mr. President. 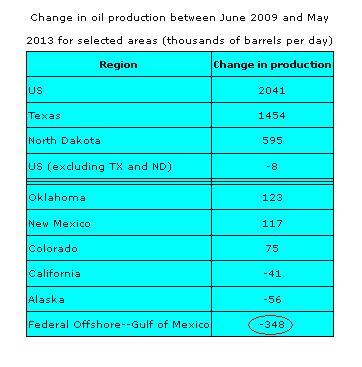 Interestingly, two states– Texas and North Dakota– account for more than 100% of the increase in U.S. production since 2009. State governments who understand the economic benefit of energy development, and actually facilitate it with responsible and effective regulatory policies, rather than choking it with unnecessary regulation.